Division Commanders had the rank or local rank of Lieutenant-General. Brigade Commanders usually had the local rank of Major-General. This usually consisted of Headquarters, an Engineer Company, and a Brigade Division of Artillery of 18 guns in three batteries, each having six 15 pounder guns and an ammunition column. Most of the troops were in the two (sometimes three) infantry brigades, each of four battalions. A battalion contained eight companies and its strength varied from 800 to 1100 men. 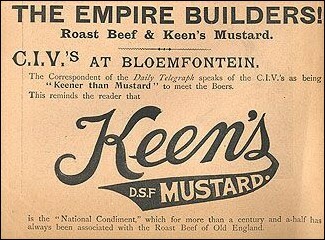 Keen’s Mustard advertisement from the War. When Lord Roberts took command, all battalions that had arrived from Britain were ordered to provide a mounted infantry company. Some complied by converting one of their eight companies, others made it a ninth company. All of these companies were formed into 8 MI Bns. In April of 1900, a reorganisation of MI took place and they were formed into two Brigades. Cavalry consisted of Headquarters, a Field troop of Engineers, two Brigades each of three cavalry regiments, and a Battery RHA. There were two 1st and 2nd Cavalry Brigades, one pair in the Cavalry Division under French, and the other operating under Buller in Natal. Except for the 15th Hussars and the 4th Royal Irish Dragoon Guards, every regiment or corps in the British Army served in South Africa; in the case of some infantry regiments, only one of their two battalions was sent there. These were drawn from sailors and marines stationed in South African waters and mostly served the guns removed from the naval ships. The brigade with Methuen was over 400 strong and a small detachment with the large guns continued with Roberts to Pretoria. In Natal, the force was split and 283 went to Ladysmith, whilst 310 manned the naval guns during the battles that led to the relief of Ladysmith. This is a relatively comprehensive list of the British Army at the time, however, a number of units listed here were not involved in the South African War. Pleasecontact me if you know which units these were. Please also contact me if you know of any regiments/units which are not listed here. Units are listed in order of precedence as of July 1881. Pre-1881 infantry regiment numbers are shown in the right margin. and who joined one of the military forces of the Crown, 1881-1898. Belfield. The Boer War (1993).